Have I got something exciting for you! 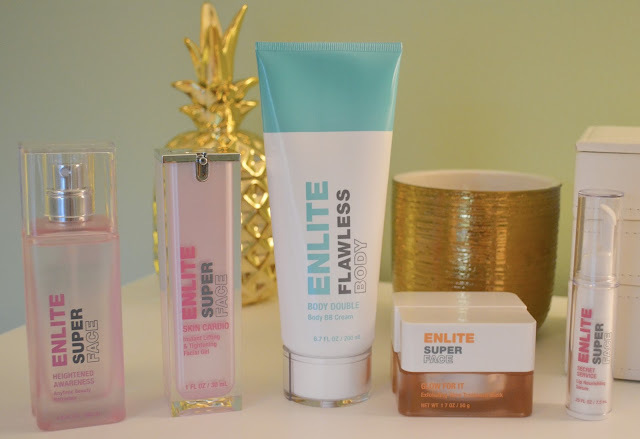 Many of you may have seen in last Monday's post that I mentioned the brand Enlite Beauty in my CVS haul. I had heard about this brand a few months ago and have had my eye out at CVS for it ever since. I knew once I found it I would have to purchase a few items and put them to the test. 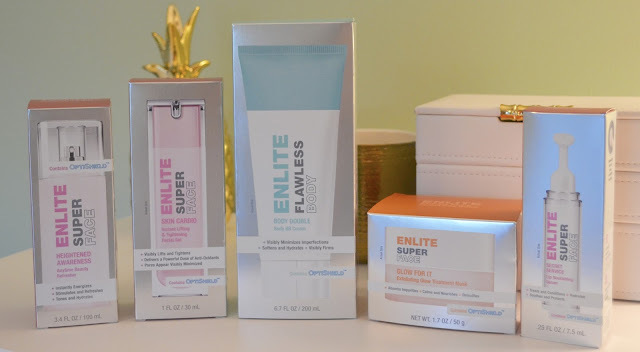 Today I will be giving you my review and thoughts on the products I purchased from this line. CVS has really stepped up their game in the skincare world and I couldn't be more excited! Like I always say, just because something is expensive doesn't mean it's going to work. There are numerous drugstore products that work better than many high end products from Sephora and department stores. I am in love with the Enlite packaging as well. It's simple, sleek and gets your attention with the pretty colors and metallic finish. 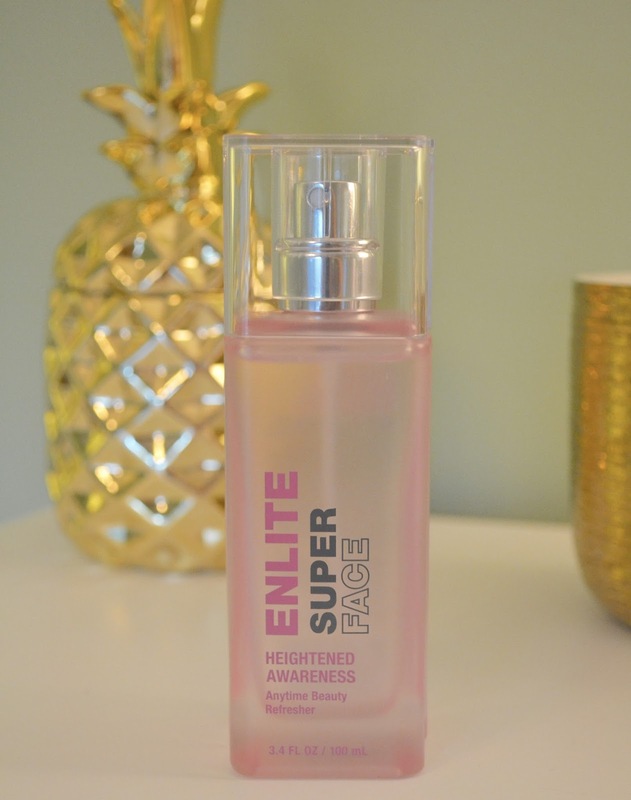 Super Face: Heightened Awareness- Oh this product smells so good! This facial mist can be used anytime throughout the day to refresh your skin when you need a little pick me up. It contains peppermint oil and coconut water to hydrate the skin and give you a quick pick-me-up. Revitalize and energize with one simple toning mist! 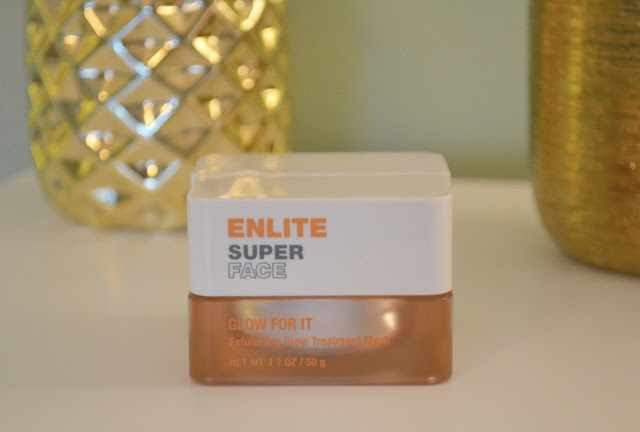 It gives your skin an instant glow! Plus it's not sticky or heavy on your face either which to me is super important in a facial mist. 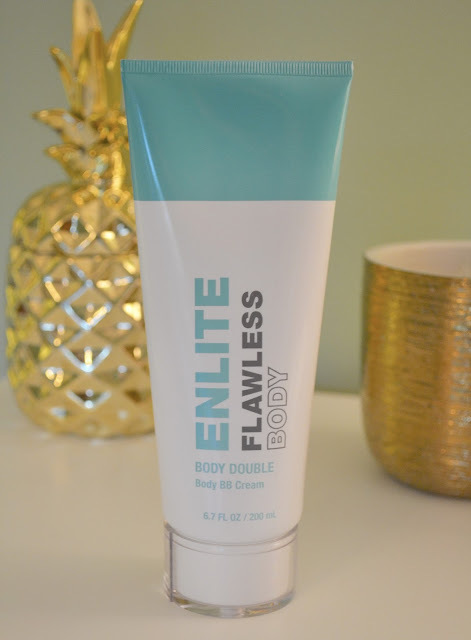 Flawless Body: Body Double- I love a good BB cream for my face so why should my body be any different? Now you can give your body some BB love with this lightweight cream. It contains hyaluronic acid, shea butter and caffeine to boost, nourish and stimulate your skin. 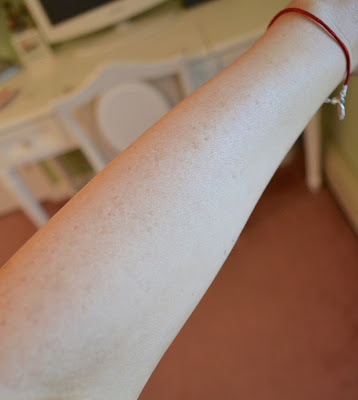 I love the subtle glow it gives to my skin as well without being shimmery or glittery. It smells yummy too, kind of like coconut! Super Face: Secret Service- This is the ultimate lip serum! It contains sweet almond oil, shea butter and vitamin E to treat, hydrate, nourish, soothe and protect your precious lips. I love the bottle as well. It looks like a needle that's going to plump your lips. 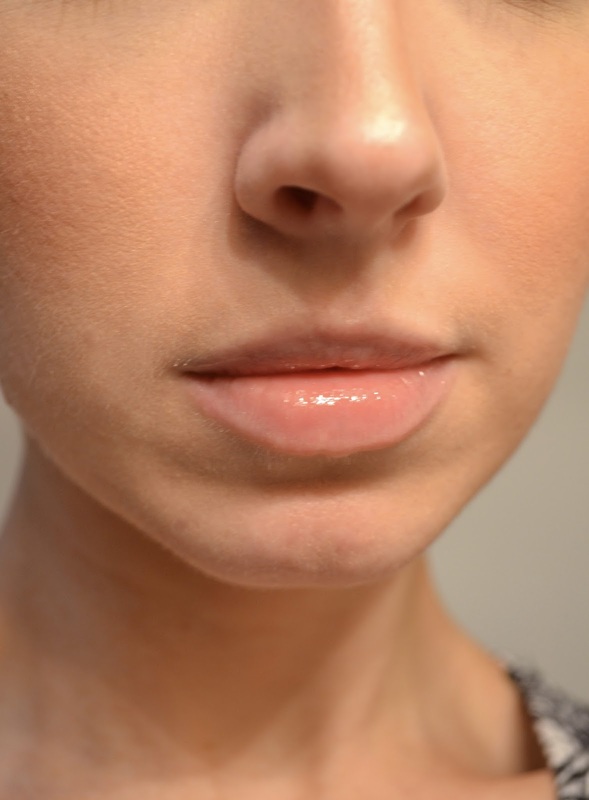 The applicator tip gently glides the product onto your lips leaving a nice even layer of product. I love the formulation as well. It's not sticky or greasy at all! It just leaves your lips with a full gorgeous sheen. Super Face: Skin Cardio- This instant lifting and tightening facial gel is my FAVORITE product from this line up! After putting this on, I stared at the mirror in awe of my skin! 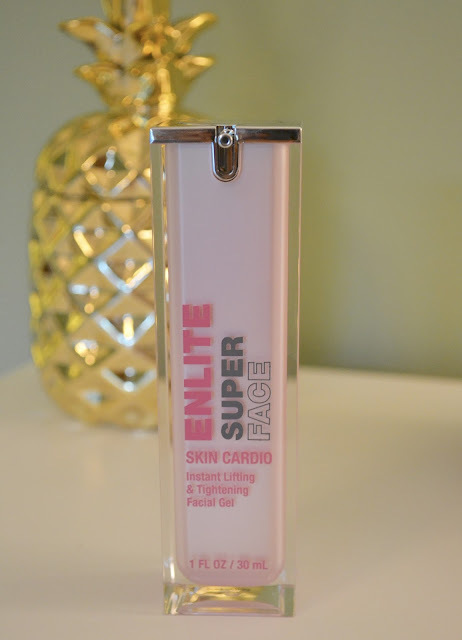 you can actually feel the serum firming up the skin! I apply this in the morning, let it sit two minutes to set and work it;s magic and then I go about my normal routine. My makeup slides on flawlessly and my skin looks airbrushed. 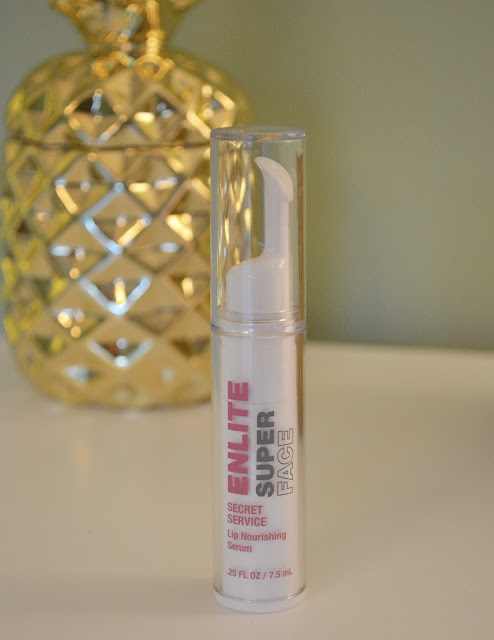 I would highly recommend trying out this serum! This is my kind of cardio haha! 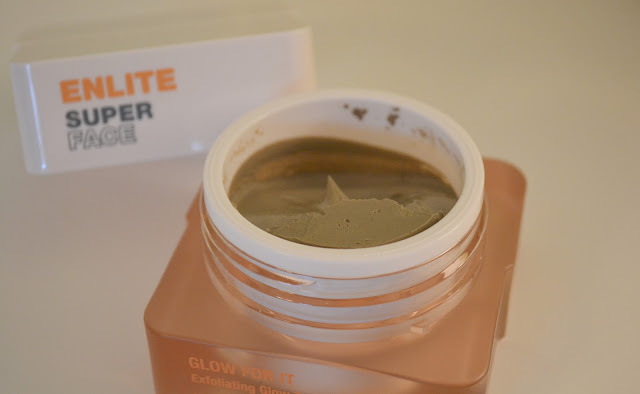 Super Face: Glow for It- This exfoliating glow mask contains Spanish Clay, Green Tea and Volcanic Ash Extract which extracts impurities, calms and detoxifies the skin. This mask is INCREDIBLE! When I first applied it, the tingly sensation was a little strong but after a few minutes it subsided and began to set. Leave it on for 15-20 minutes and once it's all dry, use warm water to gently massage it off the skin. It contains micro-fine pumice powder that gently removes dead skin cells and dirt leaving your face SUPER smooth! It also left this really cool feeling on my skin. My face felt so clean after using this mask and left behind such a beautiful glow. I would recommend using this mask once a week for an instant refresher. These aren't all of the products from the Enlite Beauty line. There are so many more other items that I would love to try out and put to the test. So far I give this line a BIG two thumbs up!! I hope you all enjoyed today's post! Let me know what products you have tried out from this line and what some of your favorites are. Happy shopping!